Wine won’t make you fat, but it certainly does contain calories. So do most things we drink other than beautiful, clear water. How many calories is that, and should that knowledge influence our behavior? Curious people want to know. For starters, the answer to that question depends upon the amount of alcohol in the wine, the size of the serving, and the number of “helpings.” Perhaps equally important, the caloric impact depends a great deal upon the circumstances in which you serve it…the accompanying food and social setting. I’ll address that more complex question towards the end. But first, the simple calories. Alcohol has 7 calories per gram; fat 9; sugar and protein 4. Knowing the alcohol concentration of the beverage and the volume, it’s rather easy to calculate the calorie content of a standard serving. You’ll find below a table which gives calorie content for wines of a typical commercial range of styles, along with comparisons to common beverages such as beer, spirits, soft drinks, fruit juice, and cows’ milk. To condense the message: most 5 oz standard servings of wine carry about 150 calories, about the same range as a bottle of beer, a shot of distilled spirits, or a glass of orange juice. An entire bottle of wine will hold 700-800 calories, still well shy of just one “modern” hamburger, but nevertheless a hefty percentage of the 2500 calories most healthy people should consume in a day. We’ve grown accustomed to seeing nutrition content labels on most of our packaged food. A few folks want to see those on wine, too. It’s part of the politics of our day. However, just because the labeling is either a dorky idea or a thinly disguised punitive counterpunch from the prohibitionists, it doesn’t mean consumers shouldn’t have a ready reference to the information. You’ll find it right here! We invite you to check out the table below! The bottom line for any calorie-containing food or beverage, of course, is arithmetic. It’s not rocket science. It’s always possible to simply serve less and still enjoy the marvels of great craftsmanship. You don’t have to eat a whole movie theater sized Milky Way or a crunch up the entire bag of seductive Maui Sweet Onion kettle cooked potato chips. Stop halfway…or never open the package until you are sure you can share it. If you love the taste of fresh, whole milk, but don’t want the fat calories and don’t care for the texture of skim, pour a smaller glass. If a 5 ounces glass of wine has more calories than fit in your program, well, have a glass with 3 or 4 ounces. Savor it, and skip the second serving. The environmental setting also changes the way we look at calories from wine. Typically, wine is consumed slowly, among company in a socially engaged setting, along with a meal which unfolds over time. That’s really different from a noisy bar or a 3 hour football game. Food served with wine tends to be thoughtfully prepared. In the Mediterranean tradition, that culinary discipline prominently involves fresh vegetables, olive oil, and modest proportions, with an emphasis upon flavor…not scoop shovel quantity. Culturally, it’s customary to serve wine with family at the important meal of the day. A good meal brings calories to you, of course, but the diversity of foods is different from nervously gorging on ridged potato chips and sour cream dip while your favorite team tries to hold onto a lead in the second half. A bottle of wine is usually shared with at least one other person. That limits the number of servings available and consequently the maximum calorie “hit.” It’s almost always going to be less than 500 calories, and usually less than 300. For women drinking along customary health guidelines, it’s more likely less than 150. As food is more slowly consumed, blood sugar rises to a lower peak, meaning that the stimulus for the body to produce insulin is muted, which in turn reduces the harmful effects of fat deposition in our tissues and blood vessels. a. In contrast, a “fast” gulping of a high fat meal along with a chuggly guzzle of super-sized flagon of sugary soda opens the door to considerable metabolic mayhem. The blood sugar leaps up with a hydrant blast of rapidly absorbed sugar, followed by a surge in insulin…right in time to greet the greasy tide of fat globules looking for new homes. You’ll wear those calories. 5. Anything that’s harmonious in moderation can be problematic in excess…true for wine just like everything else. Open the bottle and right away pour half into a tenth bottle (half-bottle, 375 ml). Top it close to the brim, leaving just enough space to put in the cork. A white wine will stay fresh and bright for 3-5 days in the refrigerator, and a young red will stay palatable for a week on the shelf…longer if chilled. Enjoy the remaining half. That limits your intake, but it also gives you a pretty clear signal if you hedge your motivation and go back for that little bottle. The economics are pretty obvious, too. Stay the course. 1. Soft drinks and juices vary in sugar content by manufacturers’ formulae. Figures below are representative, but may not be precise. 2. 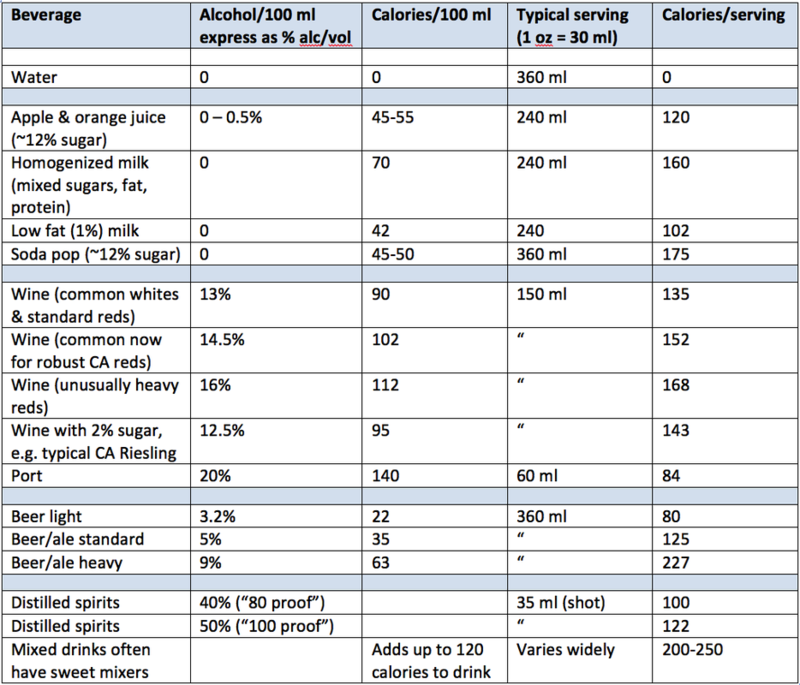 Figures for wine, beer, and spirits assume no sugar content (“dry”). Wines with residual sweetness (typically glucose 1 – 3 grams/100 ml) will have an additional 6 -18 calories per serving. One example is included in the chart for “ball park” accuracy.